The Ndlovu Youth Choir's cover, which features Wouter Kellerman, was shot in Maropeng at the Cradle of Humankind in South Africa. Ndlovu Youth Choir and Wouter Kellerman / Youtube. The Ndlovu Youth Choir, who joined Martin Bester on Breakfast on #FridayLive a few weeks ago, have now released an official music video for their isiZulu version of Ed Sheeran's hit, 'Shape of You'. Martin Bester was stunned by their rendition, so much so that he recommended that the choir open for Ed Sheeran when he visits the country next year. The international singer is set to bring his 'Divide 2019' tour to South Africa in March. 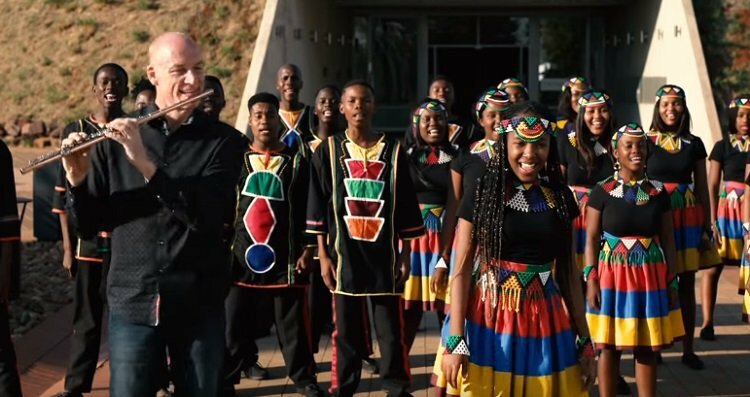 The choir recently teamed up with South African flautist, Wouter Kellerman, to film their isiZulu cover of Sheeran’s hit song 'Shape of You' - and we love it! The video has since gone viral and has received rave reviews, with some saying it is absolutely amazing.